Travel Republic is a holiday organizer which is part of the Emirates Group. The website allows customers to tailor a package holiday or book individual elements such as hotels, flights, and attractions. You can set up an account on the website when you make a booking online. They will send a confirmation e-mail with your booking information and reference number. 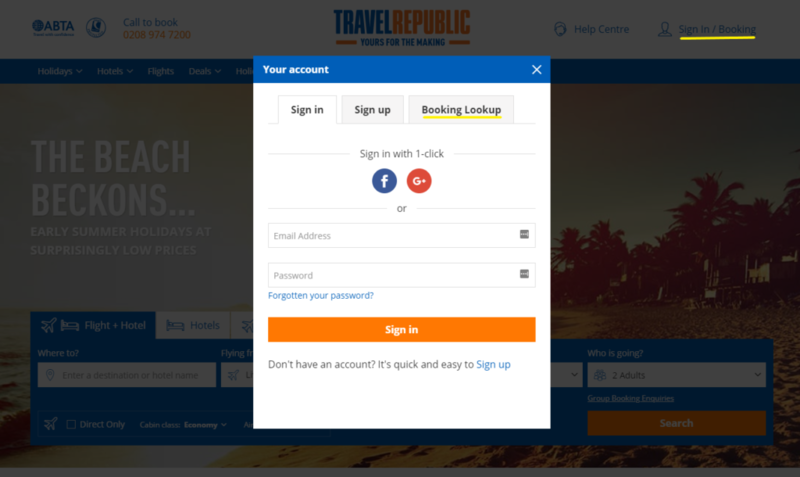 You can use your details to log in and manage your booking in your Travel Republic account. To manage your booking, go to travelrepublic.co.uk. Then click on the “Sign In / Booking” link in the top right. It will launch a log-in box where you will need to enter your e-mail address and password. Or you could use the “Booking Lookup” to find your booking using the reference number and your last name. In the “Manage My Booking” area you can view the details, make payments, add extras, resend receipts and vouchers for your booking, and more things. You can easily update your phone number, e-mail address, and payment card details online or in the Travel Republic mobile app. If you need to make an amendment, you’ll have to raise a Customer Support Request in your account. Travel Republic will try to get a new quote if you want to make changes. These are subject to the provider’s booking conditions. If the change is possible, you’ll have to pay any differences in price, plus an amendment fee from £10 up to £50 to Travel Republic. They will respond to your CSR within 5 working days. Call them if it is an urgent issue. When you make a booking with Travel Republic, you have two choices. You can either pay in full upfront, or pay a deposit. If you choose to pay a deposit, you will be given a due date for payment of the remaining balance. You can then make payments whenever you choose to complete the outstanding balance. If you fail to do this by the due date, Travel Republic will treat it as a cancellation. For accommodation, full payment is required by 14 days before the departure date. For flights, full payment is required 28 days after you make the booking. Extras like attraction tickets and car hire do not have a deposit option, so you must pay in full at the time of booking. You can make one-off payments whenever you choose in order to reach the full balance in time. If you opt into the deposit scheme, it will schedule regular payments to help you to spread the cost of the booking. Each scheduled payment comes with an administrative charge of £3.95 added to it. Therefore, it is cheaper to clear the balance with one-off payments. If you need to make amendments to your flight booking, this will depend on the terms and conditions of your flight booking. Changes may be possible according to the airline’s policies. However, they will have their own amendment charges on top of price adjustments and Travel Republic’s own amendment fees. You can log into the “Manage My Booking” section and send a Customer Support Request for help with this. You may be able to pre-book your flight seats online. If you book airport parking, car hire, or transfers, then you should be aware of problems with changes. Once you confirm a booking with a hotel, changes are dependent on the accommodation provider. The closer it is to departure, the higher the costs are likely to be, as with flights. If you made a non-refundable booking, it may not be possible to make changes. In the “Manage My Booking” section, there will be an “Amend” tab if this is possible. Otherwise, you will have to contact the Travel Republic customer support team. They will pass on your request to the accommodation provider and let you know the outcome. You will have to pay for changing your board basis.